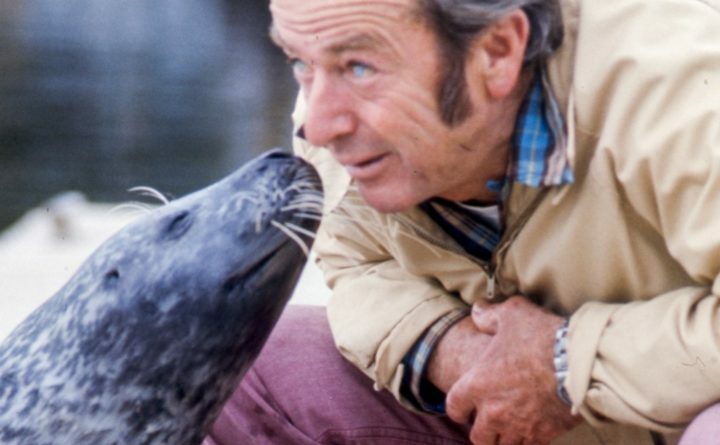 Harry Goodridge and Andre the Seal in 1974. 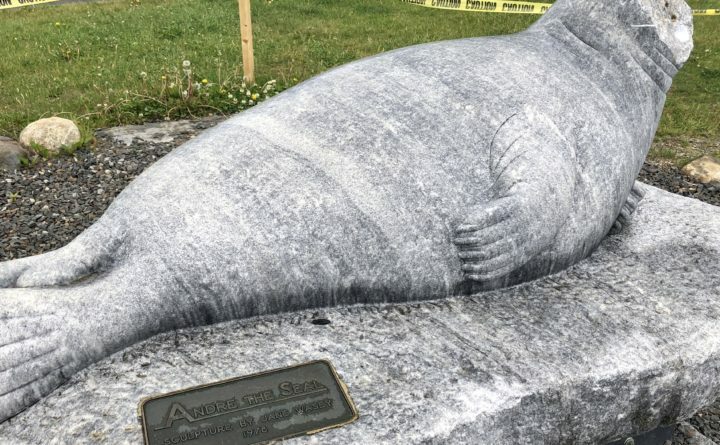 The Andre the Seal statue in Rockport is undergoing a restoration this summer, after crack formed in the face. ROCKPORT, Maine ― Rockport has launched a rescue mission to prevent a landmark honoring one of the town’s most famous residents from crumbling. The statue is not of a war hero, or even a founding settler of Rockport. It’s of a seal ― arguably Maine’s most famous seal, Andre. Andre’s relationship with Rockport began in 1961, when local tree surgeon and diver Harry Goodridge found the seal abandoned as a pup. Goodridge took Andre home and raised him, bringing him to the harbor to swim daily until he was old enough to swim freely in the ocean. For the next 25 years, Andre would return every summer to Goodridge and Rockport after wintering farther south. Andre garnered widespread fame locally and outside of Maine for his antics. His legacy lives on in the feature film “Andre,” as well as in the book “A Seal Called Andre,” and in various documentaries. But in his hometown, Andre’s legacy lives on in the form of a limestone statue, sitting just where he loved, looking out over Rockport harbor. However, admirers of the iconic seal might be alarmed to find that this summer Andre’s face is missing from the statue. The statue, sculpted in 1978, is undergoing a $14,000 restoration to repair several cracks that have formed on the seal’s face. Legacy Rockport, a nonprofit organization facilitating funding for the project, has been able to allocate $6,000 to the project, and the local garden club donated another $2,500. But the remaining funds needed to come from private donors. With just over $12,000 raised, Ames said the public’s willingness to donate is a testament to the mark Andre left on Rockport. “It’s hard not to remember Andre in a very fond manner. Even if you tried, you couldn’t come up with a negative feeling about Andre and I think that’s what we’re seeing,” Ames said. Ames lived on the harbor during the time that Andre frequented Rockport. Like many “older” Rockport residents he remembers the performances that Goodridge and Andre would put on during the summer for tourists and locals alike. In addition to drawing crowds, Andre dazzled Rockport residents. Ames recalled one instance where Andre was hiding under the dock in front of Ames’ home while they were swimming and Goodridge was pacing up and down the harbor looking for him. “[Andre] was an important part of my childhood. Like a neighbor’s dog he would play with me every morning at 6 a.m., when I was rowing in the harbor to get to our boat,” George Penny wrote in the comments of a GoFundMe page set up for the restoration project. The restoration is set to be complete by August, according to a sign posted next to the statue. After the restoration, Ames said the Andre statue will continue to remain open without a fence so people can pose with — and children can climb on — Andre. No, he wasn’t a war hero, and he wasn’t a “town father.” But if anything deserves to sit in stone as a symbol of Rockport, it’s Andre.